Apple pays a solid and growing dividend. But if yield is what you're after, these stocks might be worth looking at instead. Apple (NASDAQ:AAPL) generates a tremendous amount of cash flow. As a result, not only can investors count on their $0.73-per-share quarterly dividend checks, but that dividend should also continue to grow for years to come. Nevertheless, at just under 1.8%, Apple's dividend yield is far from the sexiest in tech. While Apple could easily afford to pay more, the company has made it clear that its share-buyback program is its top priority. So if you're looking for a tech stock with a rock-solid dividend that yields more than Apple, check out HP (NYSE:HPQ), Broadcom (NASDAQ:AVGO), and Texas Instruments (NASDAQ:TXN). One of Apple's main competitors in the PC market is HP. According to IDC, HP was the second-biggest vendor of PCs in the third quarter of 2018 in terms of unit shipments. Apple was fifth. HP isn't the most exciting business in tech. It generates its sales primarily from PCs and printers. Analysts expect it to ring up 2% sales growth in fiscal 2019, slowing to just 1.6% growth in fiscal 2020. For all of the negativity around iPhone demand, Apple is still expected to grow sales by 4.8% in its 2019 fiscal year, followed by 4.1% growth in fiscal 2020. Apple also has the benefit of control over its various software ecosystems, while in the PC market, HP builds systems around the commodity Windows operating system. Apple P/E Ratio (TTM), data by YCharts. TTM = trailing 12 months. Even so, HP has a good track record of boosting its dividend, with a current yield of 2.7% -- more than 50% greater than that of Apple. HP Dividend, data by YCharts. 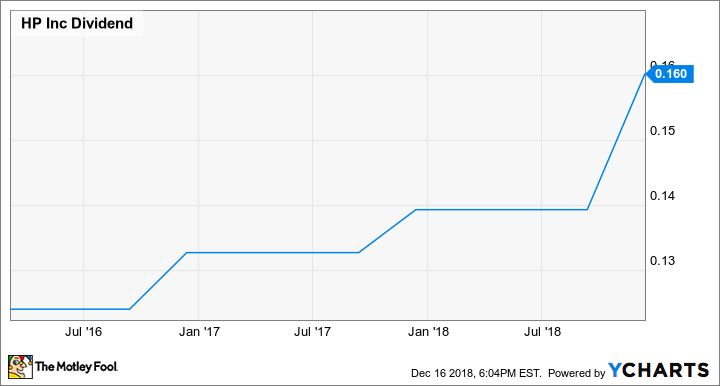 Broadcom -- which sells chips for a wide range of products, including smartphones, cable gateways, and network infrastructure -- is a great dividend growth stock. The company's stated capital return policy is to take 50% of its free cash flow and hand it back to its owners in the form of a quarterly cash dividend. Broadcom Dividend, data by YCharts. In fact, after capping off a successful fiscal 2018, the company recently announced a whopping 51% dividend increase to $2.65 per share on a quarterly basis. 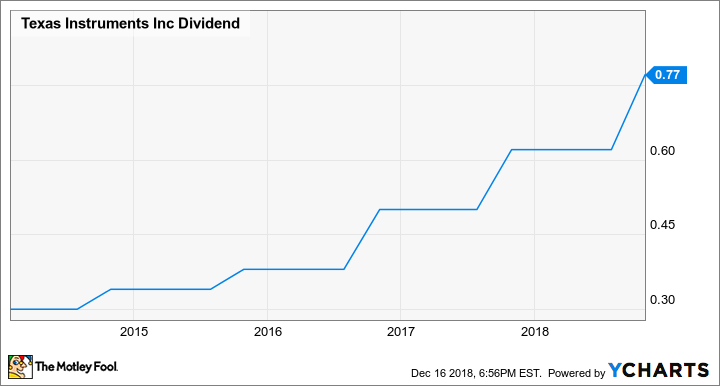 As of this writing, the dividend yield works out to 4.2% -- an incredibly generous payout, and more than twice what Apple gives back to its shareholders. Granted, this isn't a 100% apples-to-apples comparison, since Apple is due to update its own capital return policy in April. That will likely include a meaningful dividend increase. But Broadcom's yield should still be significantly higher. Moreover, Broadcom sells chips -- and, with its recent acquisition of CA Technologies, enterprise software -- while Apple sells devices and services, so the businesses aren't exactly comparable. 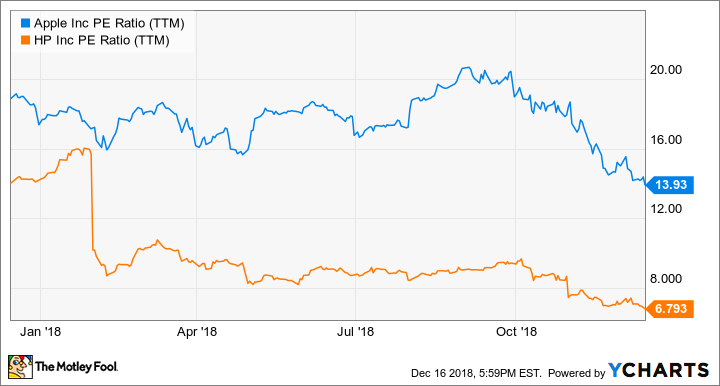 However, they're both technology stocks, and if you want a technology stock that pays out a fatter dividend than Apple, Broadcom is worth a close look. Another technology company that takes its capital return program very seriously is chip specialist Texas Instruments. The company has an extremely generous capital return policy, under which it hands back all of the free cash flow it generates to shareholders, through a combination of dividends and share repurchases. The company recently boosted its quarterly dividend from $0.62 to $0.77 per share, for a yield of about 3.3%. That's less than Broadcom's yield, but it's significantly more generous than Apple's dividend. It's better than HP's current dividend, too. Moreover, given Texas Instruments' commitment to return all of its free cash flow to shareholders and its long history of steady dividend increases, investors should be able to bank on continued dividend growth well into the future. 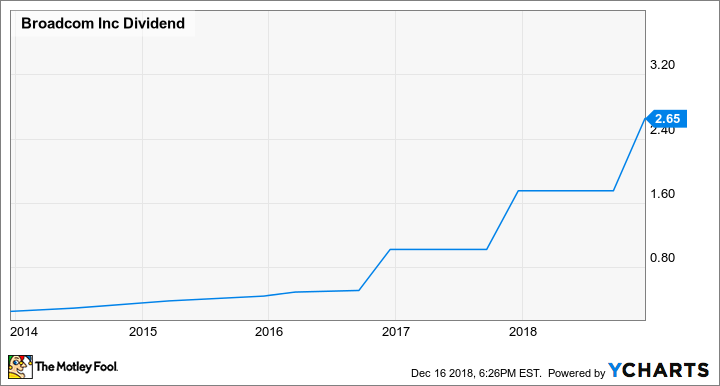 As far as the reliability of the dividend and the likelihood that it will continue to grow, Texas Instruments is right up there with Apple in my book. Texas Instruments Dividend, data by YCharts. If you're looking for a tech stock that's more generous with its dividend than Apple, Texas Instruments is another one for your short list.